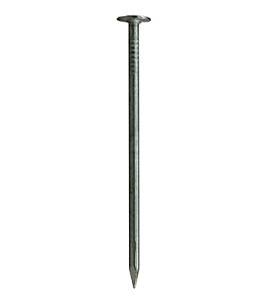 PRODUCT: 6" 60D Electro-Galvanized Tile Roofing Nails, 8 Gauge (0.162)" nail, 7/16" Head, 50 Lb. Box Price/Box. QUANTITY: PACKAGING: 50 Lb. Box. About 27 nails / lb., 1330 to 1350 per box. 48 Boxes / pallet. Order full pallets for discounts. SPECIFICATION: Meets US Standards ASTM F1667-03 and FFN-105B. OPTIONAL SIZES: Available in 5, 5-1/2" and 6" lengths and in copper material.